Hello, Toy-A-Day'ers! It's 3B and this week is "Foxy Ladies" week over at Killer B Hive. I wanted to share some of the foxiness with Novelty by reviewing today's foxy lass, Wonder Woman, here at Toy A Day. So we'll be looking at her action figure from a classic toy line I have fond memories of: Toy Biz's DC Comics Super Heroes! I should mention that this line debuted the same year as Tim Burton's Batman movie. Toy Biz acquired the license to make the movie figures and a line of DC Comics characters. The Batman figures all came on similar cards except they featured the Batman movie lettering on the front of the card instead of the DC Super Heroes text and had a purple strip across the top of the card instead of the red one. Although the main line featured several super heroes, only villains from Batman's rogues gallery were ever released, Lex Luthor being the only exception. The quality of the figures weren't particularly great and DC eventually pulled out of the deal and gave the license to Kenner. That's why Kenner was able to release "The Dark Knight Collection" in 1990. Now, with that little lesson out of the way, back to Wonder Woman! If there is one thing this toy line had going for it, it's the great packaging! The card front features an iconic image of the character the packaged figure is based on. A burst near the bottom of the card identifies the action feature unique to the figure, in this case it's Wonder Woman's "POWER ARM!" which supposedly "THROWS GOLDEN LASSO". On the back of the card you get a little breakdown of the action figure's feature and accessory plus a mock newspaper clipping with some biographical data on the character. I have all of the figures in this toyline, all MOC because I just love the package as a whole. I've contemplated opening them up (it would really free up some space), but I can't bring myself to do it. I think that I enjoy them so much more with packaging, I just have some really great memories of seeing them on the shelves at the local toy store (Lionel Playworld at the time, anyone remember that?). I guess it's the nostalgia factor. The images above are of my MOC figure while the actual figure reviewed below is a second loose figure I own. Since these were mainly targeted at children, the likeness is kind of generic. She looks like a woman and her outfit makes her wondrous, but it's not a sculpt based on a specific image of Wonder Woman. In the 1980's and 90's kids weren't really worried about sculpts and all that. Personally, I was just happy to have toys based on my favorite superheroes, although they never had a comic-based Batman figure in the line. WW's entire costume is sculpted on, from her tiara, armored bra and mystical bracelets down to her pretty red boots. I think they took some liberties with the shape of her body, though, she's a full-figured gal! I mean just look at those hips! It seems Diana was enjoying all the american fast food she could find when she arrived from Paradise Island. What was it Queen said about fat-bottomed girls? Even though this figure is 20 years old, I remember that paint was an issue with the line. Mainly when it came to their logos and secondary paint apps. Some of it is sloppy, even completely overlooked in some spots. My loose figure has some random black spots on her tiara just next to the star. You'll also notice her armor isn't painted gold. No, back in the eighties yellow was the new gold and blue was the new silver. Check out her bracelets! Toy Biz's DC Comics Super Heroes line was heavy on the action features. 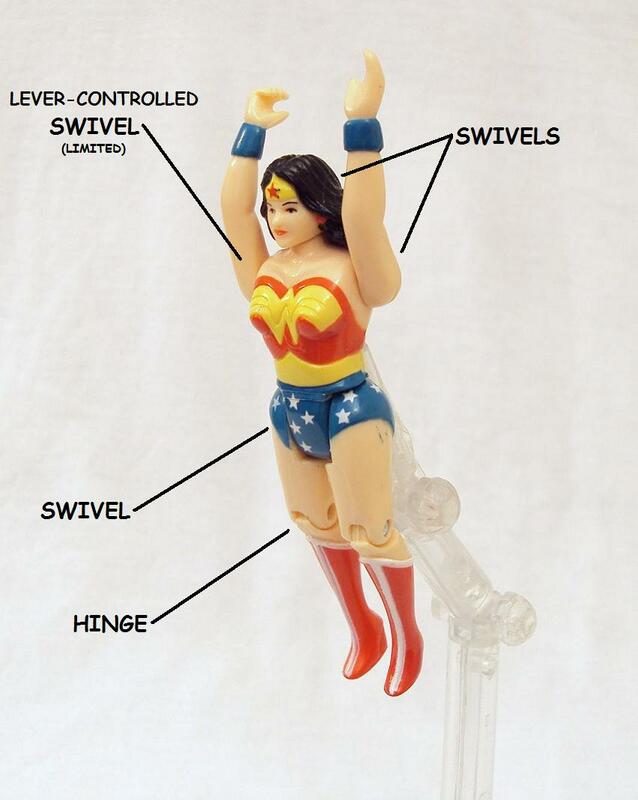 Wonder Woman has a "power-arm" controlled by a lever on her back. Unless the lever is depressed her arm stays raised as if she's waiting to be called upon by a teacher. That's not the kind of action feature I enjoyed as a kid because it meant the figure stayed that way. Now that I mention it, I think I ended buying two of these as a kid because the arm broke off on one. You see, it's not one of those "click" gadgets that let you set the arm at a different position. It's static on the peg, so if you pull it down past it's normal range, the arm will just snap off. Even worse it doesn't really work with the whole "throw her lasso" gimmick. It's more like "drop the lasso". 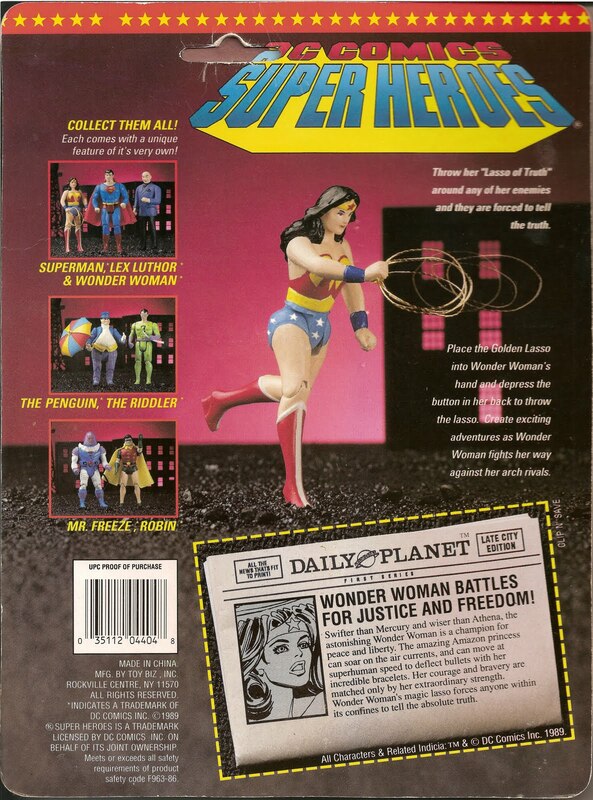 Of course, Diana comes packaged with her golden lasso as her one and only accessory. It's essentially a gold thread that does not hold any particular form and it's folded so many times in the package that it's all crinkly and ugly when you remove it. It's pretty much completely useless unless you tie it around something. Here's a comparison shot with the only Kenner Super Powers figure I own, the Flash, and Green Lantern from the same line as Wonder Woman. As you can see the Toy Biz figures are a bit taller than Kenner's, but Diana is still shorter than Flash. She looks puny next to her male counterparts in the line, which is every other figure in the line. Did I forget to mention she was the only female in the line? Looking back at the toys of yesteryear you gain a new appreciation of what's currently on the market. With all it's flaws, DCUC is the definitive DC toy line and I enjoy collecting it (most of the time). But that doesn't mean there is no value to this figure. Toy Biz's WW may not hold up against today's standards, but you have to consider that at the time, they were the only game in town. AND I don't remember another Wonder Woman action figure showing up for nearly a decade afterwards, possibly longer. Nowadays you have several options. Mattel has Wonder Woman figures in DCUC, JLU and Infinite Heroes and that's not to mention DC Direct's offerings. This version will always hold a soft spot in my heart for being MY Wonder Woman.